Ed Brubaker and Matt Fraction charged their glowing pen filled fists to co-scribe one of Marvel's best ongoing titles in the past 5 years, The Immortal Iron Fist. Revamping Marvel characters is nothing new to this pair of yarn spinners. Fraction's Invincible Iron Man recently won an Eisner Award and Ed Brubaker has written some of the best Daredevil and Captain America stories ever. It should come as no surprise that their run on The Immortal Iron Fist is as well done as it is. 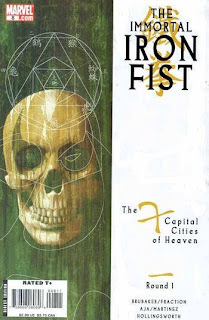 The Immortal Iron Fist #8 starts Brubaker and Fraction's second full Iron Fist arch: "The 7 Capital Cities of Heaven". Danny Rand, Iron Fist, is introduced to the 7 other Heavenly City's Champions. He learns that there is a tournament conducted every so often to determine which city is held with the greatest esteem. This issue is mainly an introduction to the other fighters; however, it also begins to explore Wendel Rand's (Danny's father) discovery of the heavenly city of K'un L'un. With flashbacks woven into the story we are treated to character/family development along with the ongoing "Mortal Combat" style tourney introductions. I say "Mortal Combat" style because the 7 different fighters all have a unique fighting style. There is the basic Iron Fist with the power of his inner energy, or "chi" if you will...and you will. We see a sumo-like fighter, a woman with fans and spider attacks, a green fog-like character and so on. The characters are quite fun presentation wise, as well. Which brings me to David Aja and Matt Hollingsworth. Aja draws the most amazing Immortal Iron Fist issues, giving his art both simplicity and grit. Without over detailing or exaggerating figures, he uses a slightly broken line style of art which creates a rugged interpretation of Iron Fist so real the chi radiates from the pages. Hollingsworth's limited and muted color pallet fits Aja's work so well that seeing Iron Fist in other books will come off as cheap. "That's how they drew and colored him...? They would." Instant snobbery after being treated to the Aja/Hollingsworth Iron Fist. The Immortal Iron Fist #8 is my comic of the day because it is the first individual issue of Iron Fist I ever bought. I started with The Immortal Iron Fist: The Last Iron Fist Story (issues #1-6) hard cover and then continued on with the monthlies. Unfortunately, I can not reminisce with the hardcover because I loaned it to a friend and can not remember which friend I loaned it to. Please, if you are that friend, return it to me. If you never tell me so that you can keep it for yourself I would understand. The book is that good.